Ah yes, the ol’ treasure hunt for lip tingling, mouth numbing chicken, garlic, ginger, scallion and peanut nibbles amidst a mountainful of chilis. Just like eating [ravenously] with your hands and sucking [audibly] on your fingertips is absolutely welcome and furthermore, expected in Chinese dining etiquette, so is fishing through a pile of chilis with your own chopsticks (not the “communal chopsticks, mind you), for tiny pieces of big flavor items that are not so chopstick friendly, especially for the ill-practiced chopsticker. 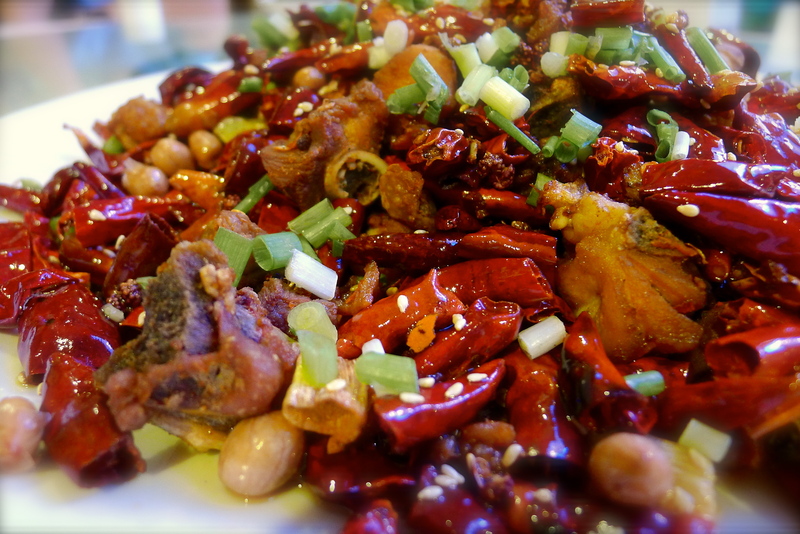 Time and time again, I find myself at this Beijing favorite for the most authentic Sichuan food in town. The locals go here. The Sichuanese go here. The Sichuan embassy folks from upstairs go here. How many more ways would you like to hear, “This place is legit”? Added bonus: their menu comes with pictures so you don’t have to remember these Chinese characters, just the photo. This entry was tagged Beijing, Chuan Ban, lazi ji, sichuan. Bookmark the permalink. Love your lively writing about food – draws me in and makes me hungry!